Excellent group of products to help stay safe while using both hand and power tools. A-6102 Roll of Vetrap tape – Protects fingers during close work with sharp instruments. Self-adhering tape is easy to apply and requires no pins, clips or adhesive to secure it. Tape won’t loosen over time and stays in place until removed. Re-positionable, doesn’t stick to hair or skin, only to itself. 2″ wide x 15‘ long. A-6103 3M Soft Foam Ear Plugs (3-Pack) -Made of hypo-allergenic materials and have a tapered cone shape for a good fit and comfort. Plastic cord prevents tangling. 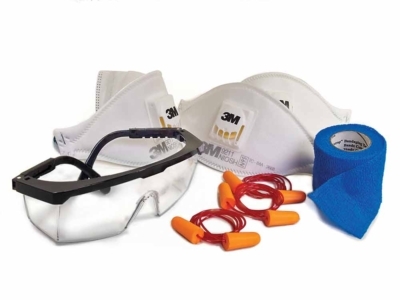 A-6106 3M Particulate Respirators (3-Pack) – fit a wide range of face sizes. A three-panel respirator with low profile design folds flat has Cool FlowTM Exhalation Valve for work in heat and humidity. Comfortable, lightweight and convenient. A-SG3 Safety Glasses Clear polycarbonate glasses with contemporary style and unitary lens design. Temples are length adjustable with slotted ends. Comes with neck cord. 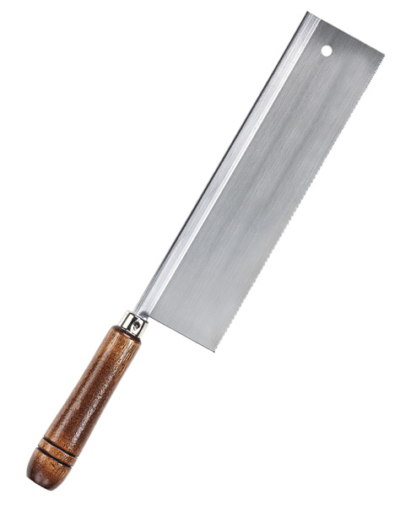 Medium Kerf Woodcraft Saw has a blade that is .015″ thick, with a tooth set range of .016/.018″, 24TPI, 6-1/2″ long, with a 7/8″ cutting depth, and steel back for stability. 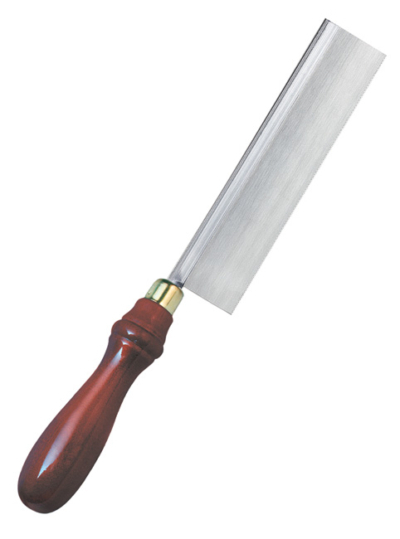 Excellent for pull stroke cuts in hard or soft wood. Blade is NOT Interchangeable or Replaceable. Flush Cutting Razor Saw has a blade with medium kerf that is .015″ thick, with a .013/.015″ tooth set range 16TPI, 6-1/2″ long, 1-1/4″ cutting depth, flexible blade. For pull stroke flush cuts of dowels, pegs, tenons without marring hard or soft wood surfaces. Made in USA. Blade is NOT Interchangeable or Replaceable. Thick Kerf Dovetail Saw has a blade that is .020″ thick, with a .022/.024″ tooth set range, 18 TPI – teeth per inch, 8″ long, with 1-3/4″ cutting depth, and steel back for stability. 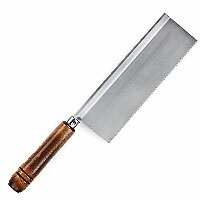 Excellent for push stroke cuts in hard or soft wood. Made in USA. Blade is NOT Interchangeable or Replaceable. 6-1/2in. aluminum miter box has thin slots for 30, 45, 90 degree angle accurate cuts with Deluxe Handle 35-560 fine kerf saw. Saw Specs-24TPI, .010in. Kerf, 6-1/2in. long x 1-3/16in. deep. Made in USA. 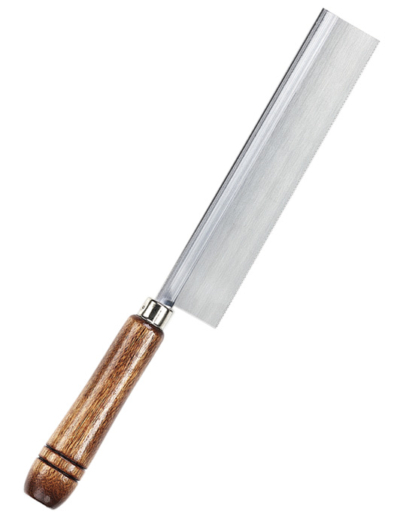 Deluxe Handle Fine Kerf Universal Razor Saw has a blade that is .010″ thick with a tooth set range of .012/.014″, 6-1/2″ long, with a 1-3/16″ cutting depth, and steel back for stability. 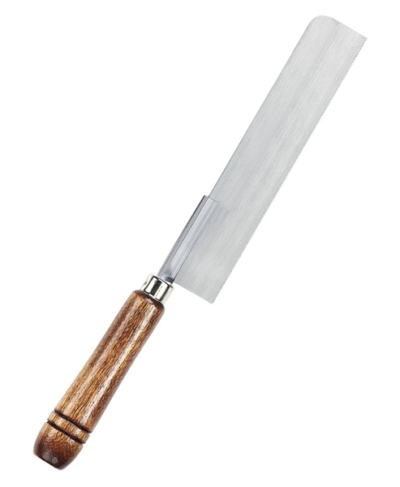 For pull stroke cuts in balsa, other wood, plastic, copper and brass. Leaves smooth edges. Made in USA.